The Outsourcing Market: Facts & Figures | Quality House Ltd. Which Industries are More Inclined to Outsourcing? *Please, note that in 2013 the global software testing market was around 30 billion US dollars and is expected to grow to 50 billion US dollars till 2020. What can be identified as a major benefit of the outsourcing in general is that the right outsourcing provider can introduce successful products/services, different approaches, higher revenues, unparalleled experience and streamlined operations. However, the process of identifying a partner like this is definitely not an easy task. It requires a comprehensive and objective assessment of the provider’s outsourcing potential. 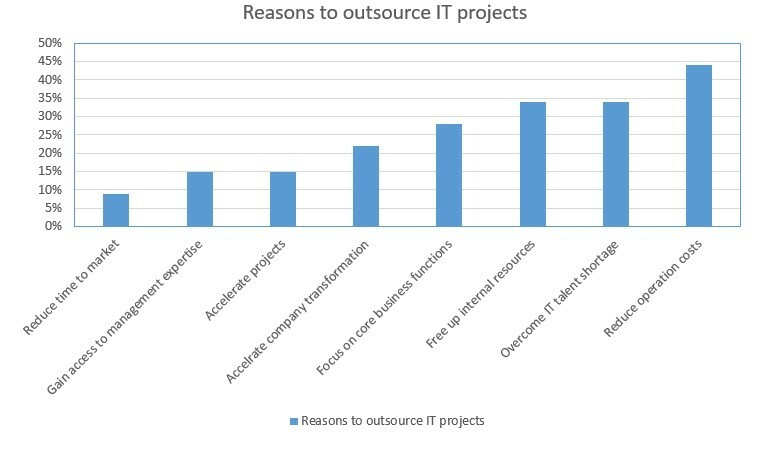 Why Companies Choose to Outsource? Fast delivery of high control – trusted outsourcing providers bring customers deep industry and functional experience, with supporting infrastructure and approaches, enabling faster speed and higher quality. Team scalability – variety of outsourcing engagement models empower the customer with exceptional flexibility, supporting their requirements to scale the team up or down according to the always changing staff demand. Access to global skills – tapping into the global talent pool ensures a flow of fresh innovative ideas and insights for business. Cost savings – lower cost geographies driven by highly skilled employees are a good choice for reducing operating expenses. Any business can benefit from global services today. Time efficiency – internal staff can focus on the other mission – critical business needs while, not being concerned about routine tasks. Increased revenue – all in all, outsourcing helps companies worldwide to increase revenue and gain competitive advantage of the above mentioned Fast delivery of high quality, Team Scalability, Access to global skills, Cost savings, and Time efficiency. Sensitive data exposure – to lower the risks of accidental or intended data exposure, companies sign a Non-Disclosure Agreement (NDA) through which the parties agree not to reveal confidential information predefined in the document. The hidden costs – the threat of hidden costs can be easily prevented by a clear and transparent outsourcing contract. Both parties should thoroughly cross-check the document since it is a prerequisite for successful cooperation. Management control loss – while selecting an outsourcing engagement model, companies decide whether to leave management control of outsourced processes in – house or pass it to the vendor. Still, Having in Mind All the Risks, Why Do IT Companies Outsource? Language and time zone differences. As close time zones and good language skills definitely contribute to the productivity and the communication, this obstacle should be carefully considered. Do your homework and learn more about the outsourcing services provided by the vendor – just to be sure you receive the best service. Check customers’ reviews and feedbacks. Check what the infrastructure of the vendor is and what kind of devices the vendor possesses. Make sure the vendor is experienced in managing outsourced projects if you have decided not to monitor the process. Of course, each company makes the decision to outsource based on its objectives and due to different reasons. Sometimes, the factors that influence the decision to outsource the most are just cost savings and nothing more. Other times, it is the desire of the company to gain additional knowledge and make sure that the product it delivers is of great quality. Now that you know how to decide whether to outsource or not, you’ll find the best place to do it in the next article, expected in the middle of March.